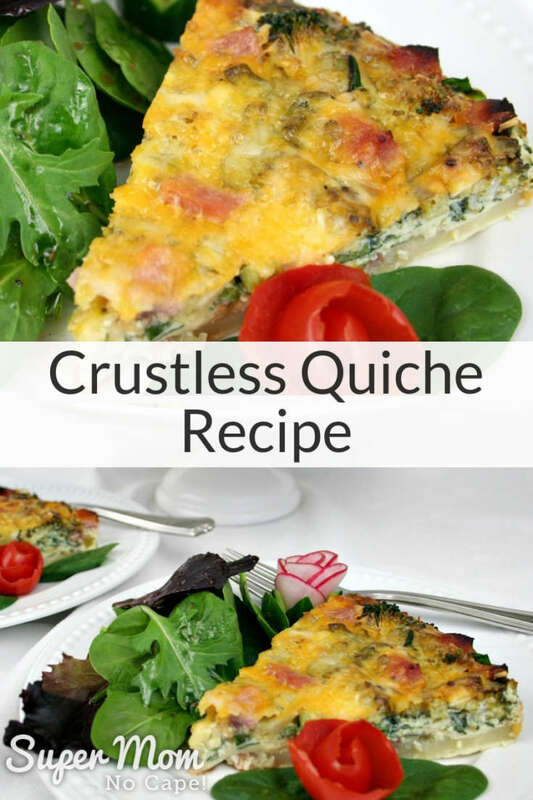 This Crustless Quiche recipe is so easy and quick to get in the oven that in addition to serving it for Sunday morning brunch, you may just find it becomes one of your new go to meals for busy weeknights. About 15 minutes prep time and then into the oven to bake while you get the rest of your and your family’s evening organized. 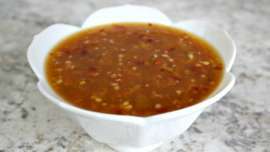 I’m going to give you the basic recipe that I use but I’ll be completely honest and say that I rarely make this the same way twice. 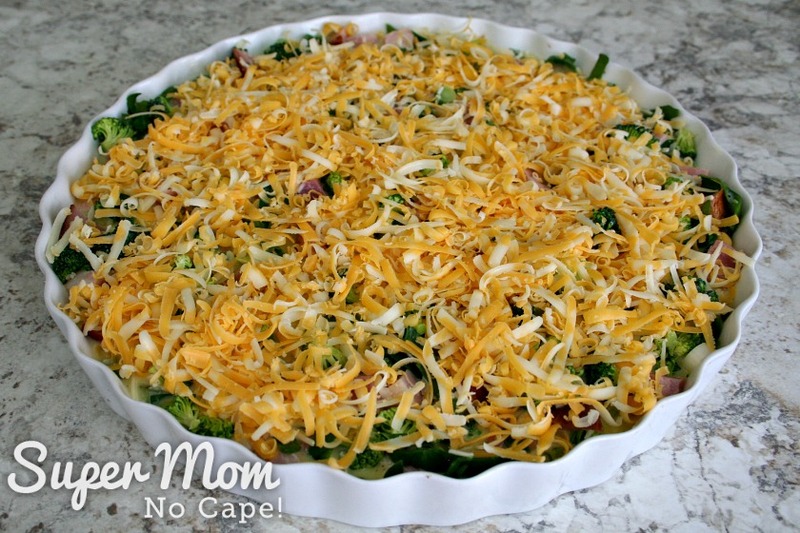 It’s such a great way to use up all those little bits and pieces of veggies and small chunks of cheese and meat that I usually just use whatever we have in the fridge at the time. Generously butter whatever dish you’re using. 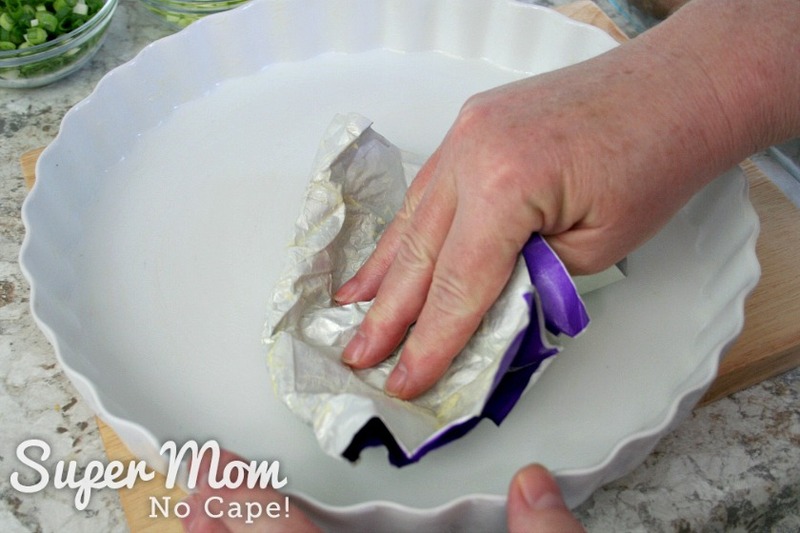 I used a 10.5″ fluted quiche dish but you can really use any kind of shallow baking dish. 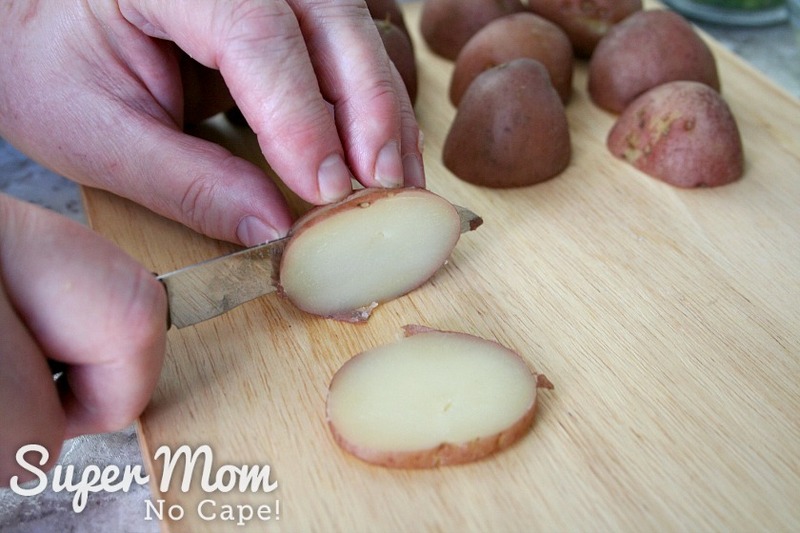 Slice leftover potatoes about 1/8 inch thick and arrange in a single layer in the bottom of the dish. 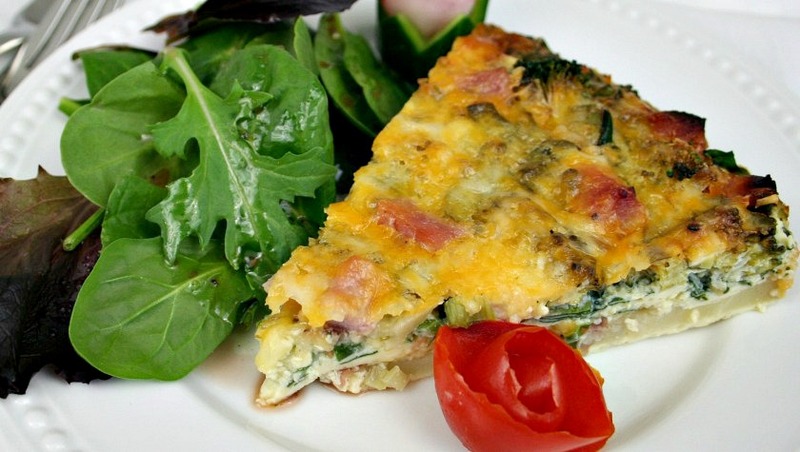 The potatoes create the base of the quiche, replacing the crust. 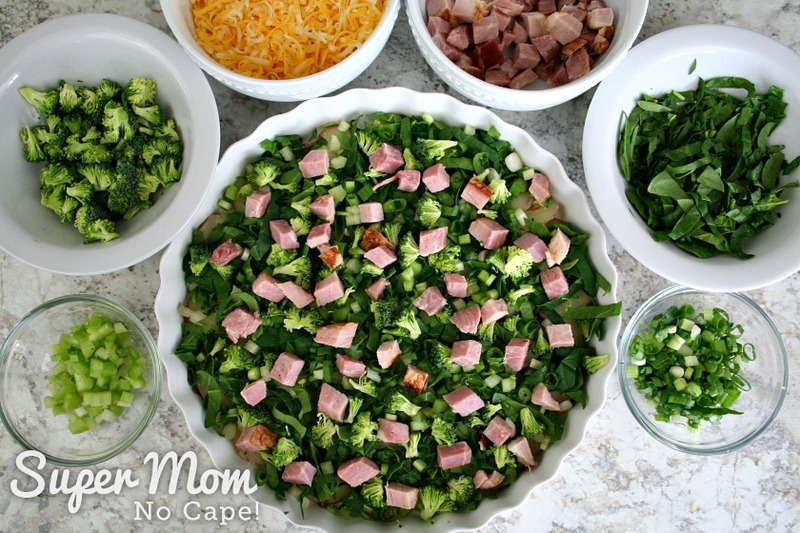 Next, layer on half of each of the chopped vegetables and ham, starting with the finely sliced fresh spinach. 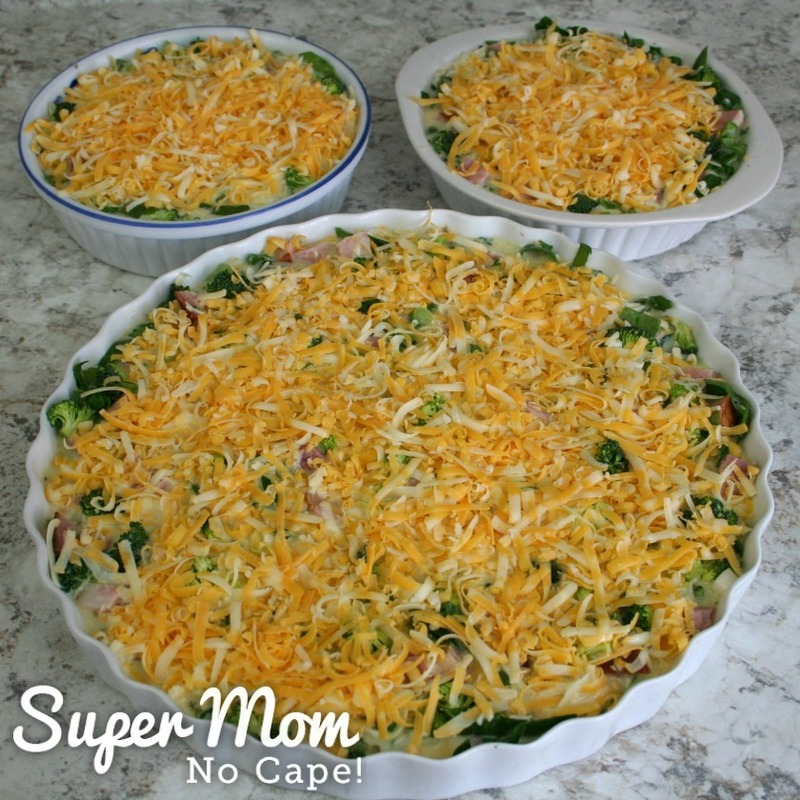 Adding the other ingredients on top of the spinach keeps it from floating to the top when you add the egg mixture. Note: Reserve the grated marble cheese for the final topping. 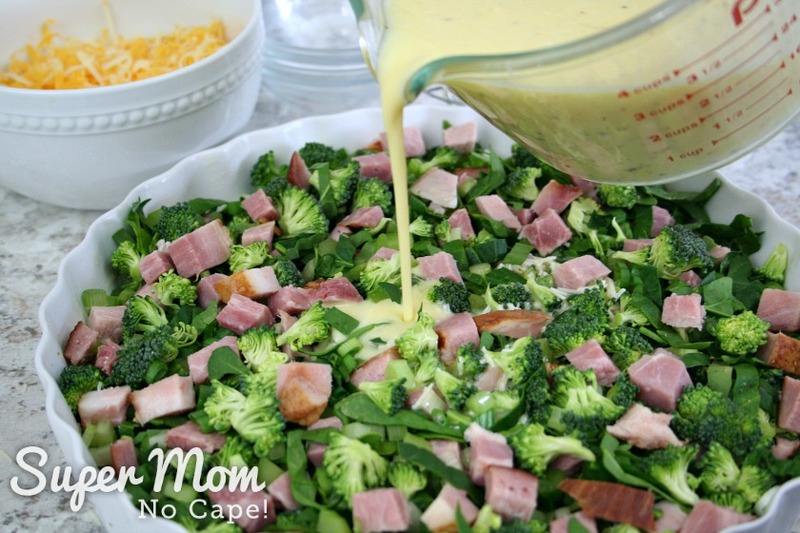 Add a second layer with chopped veggies and ham. . Crack the eggs into a large measuring cup and beat well. Stir in salt, pepper, garlic powder and Parmesan cheese. Pour over the vegetables and chopped ham. Top it all off with a generous layer of the grated marble cheese. 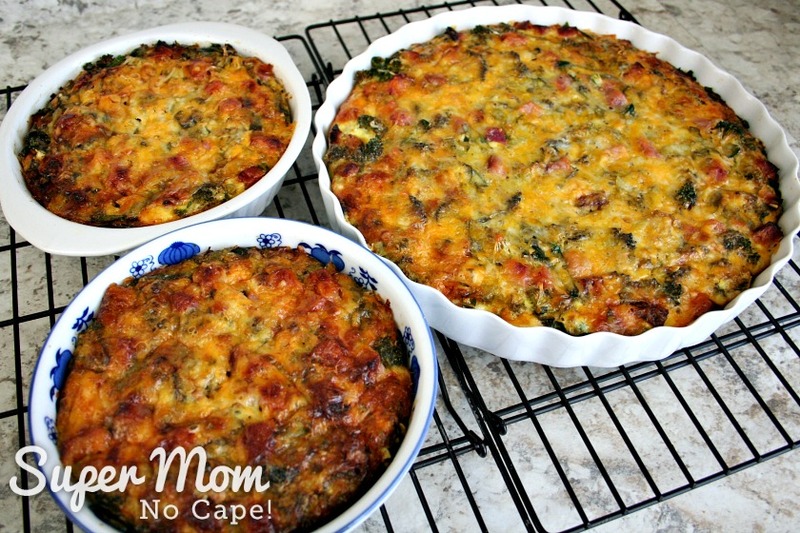 Quite often I will double this recipe and divide all the ingredients between one large quiche dish to be served that day for brunch or dinner and two smaller dishes to pop into the freezer for future meals. Bake in a 350 degree F oven for about 50 to 60 minutes or until the egg mixture has set and the top is a nice golden brown. 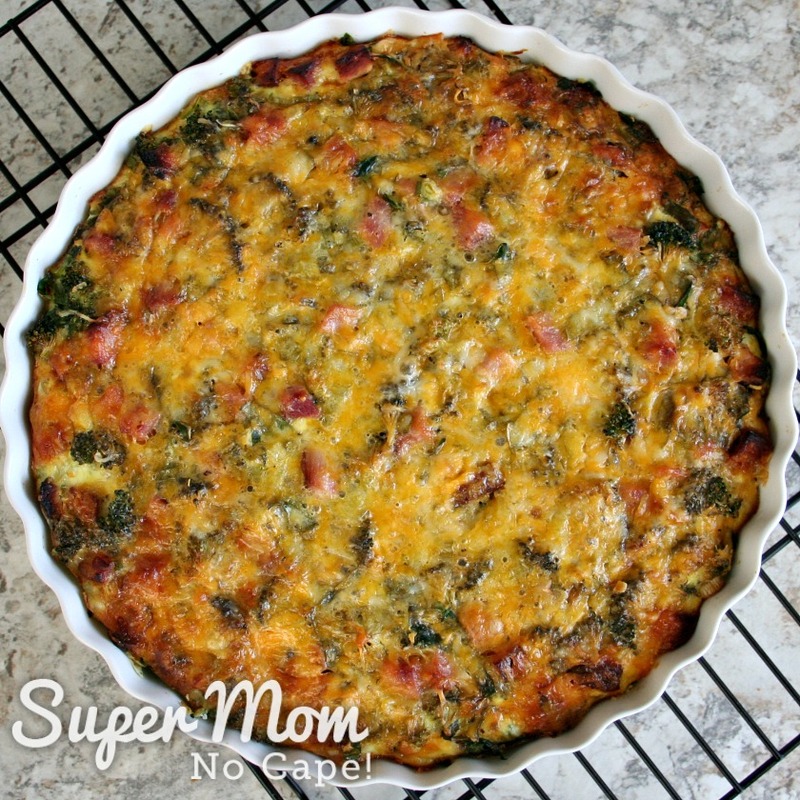 If you’re having the crustless quiche for a weeknight dinner, it can be served directly from the pan. 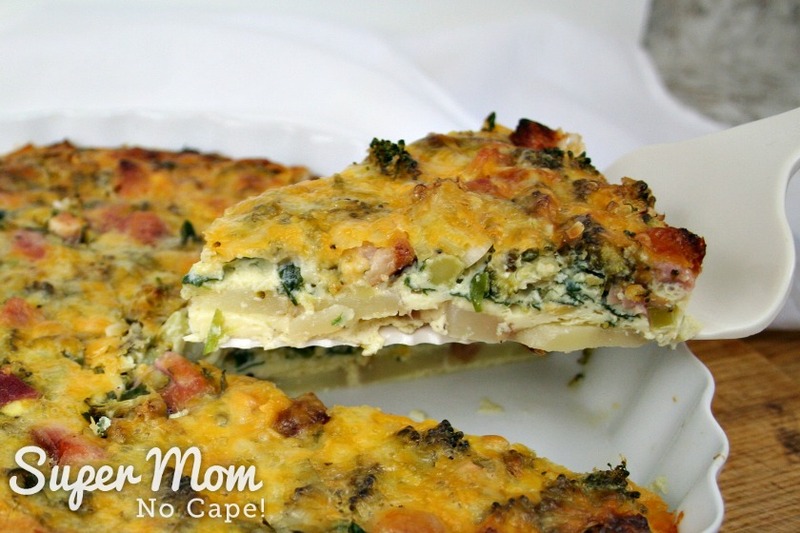 But if serving for Sunday morning brunch, you may want to slice and transfer the entire quiche to a pretty cake plate. 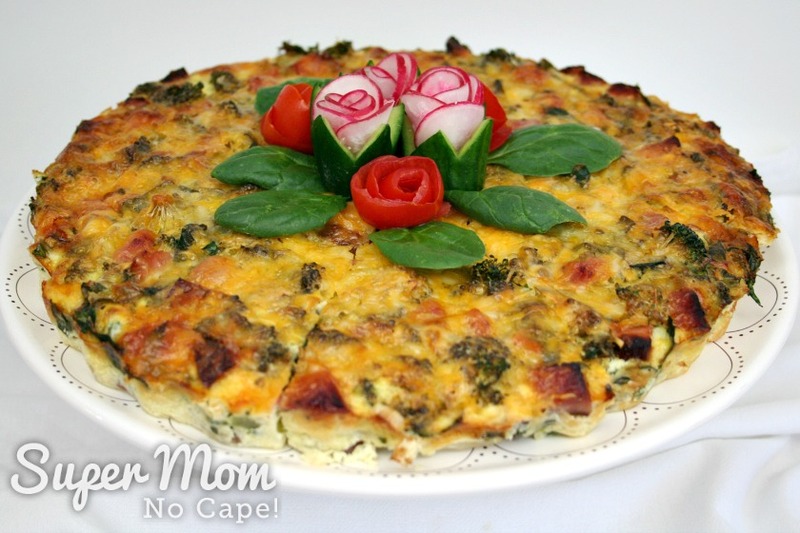 Here, I’ve garnished it with radish and tomato roses and whole baby spinach leaves. 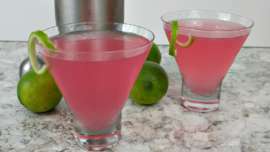 You’ll want to make extra garnishes to add to each plate. Be sure to save this delicious gluten free recipe so you can find it again by clicking on the Pinterest button underneath this post. No need to fuss with rolling pastry when you make this easy Crustless Quiche for your next Sunday morning brunch. 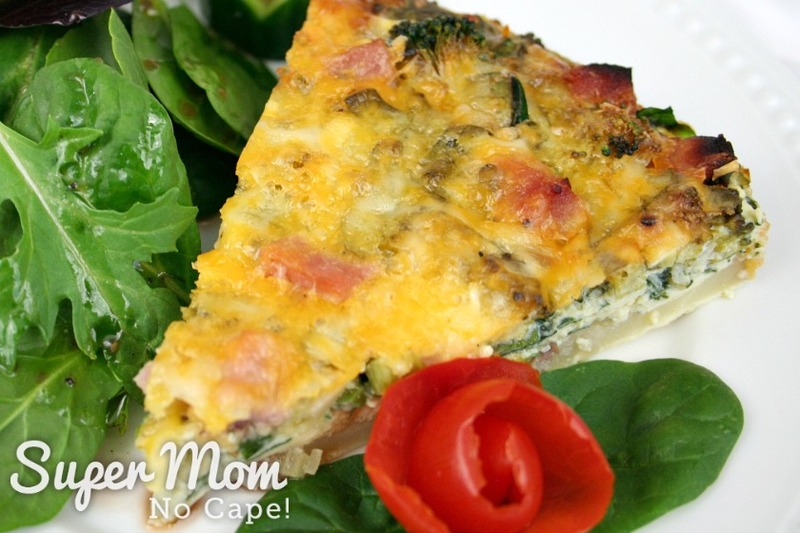 It’s so easy that you may just find it becomes one of your go to weeknight meals. Chop the green onions and celery. Cut up the broccoli florets. 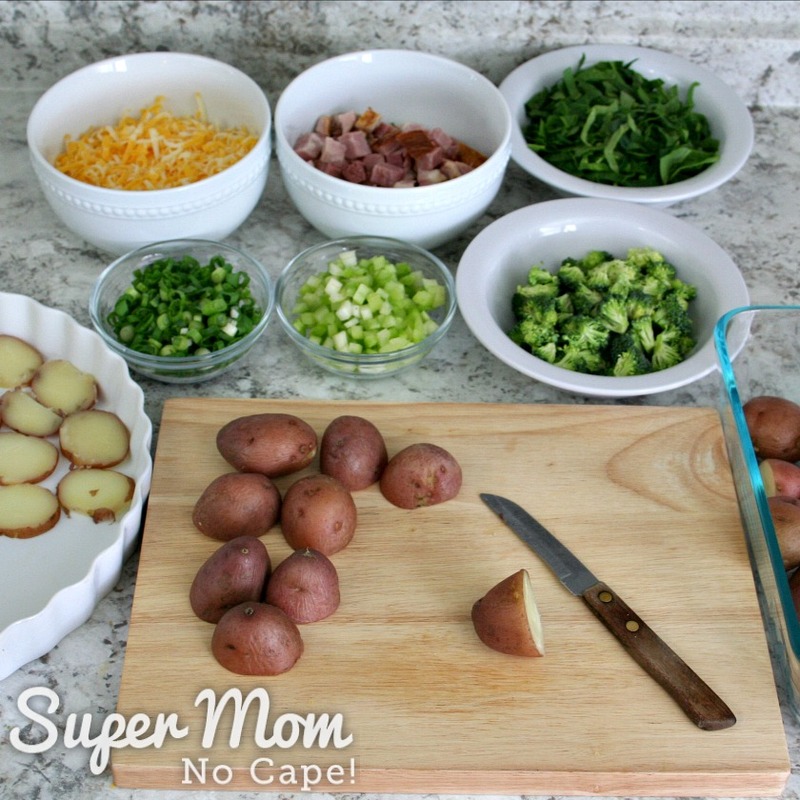 Slice the potatoes and layer in the bottom of the quiche pan. 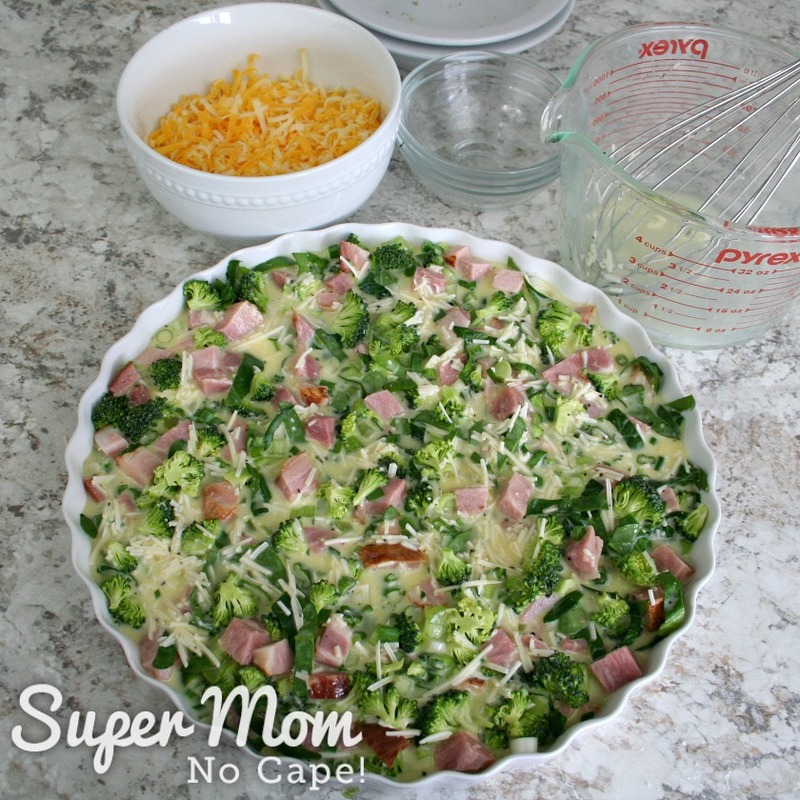 Layer on half the vegetables and ham, starting with the spinach. Beat together the eggs, milk, salt, pepper, garlic powder and Parmesan cheese. Pour the egg mixture over the vegetables and ham. Top with the grated marble cheese. Bake at 350F for 50 to 60 minutes unless the filling is set and lightly golden brown. 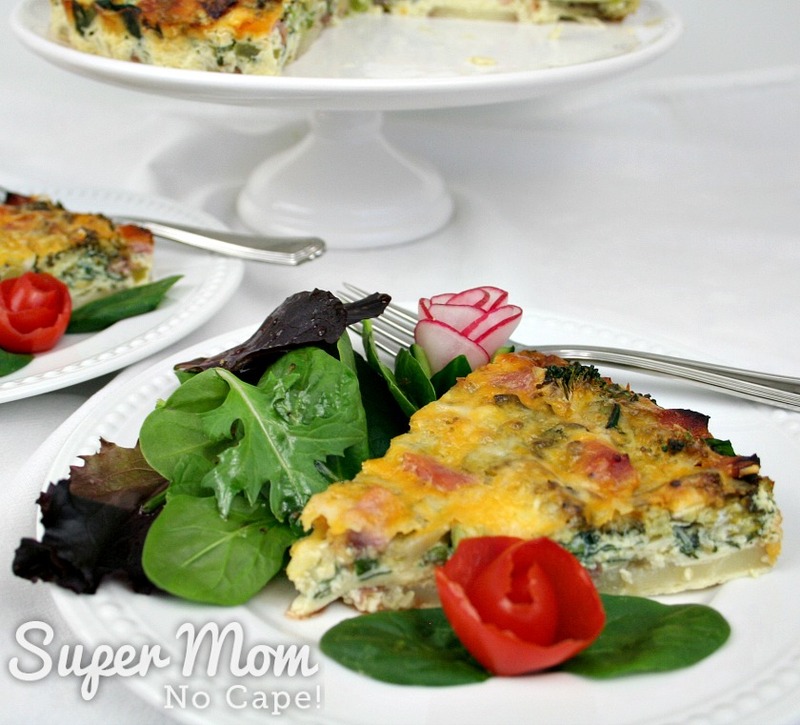 This recipe for Crustless Quiche was originally published on Super Mom – No Cape in November, 2014. It has been completely updated with new photos and more detailed directions. That looks delicious!! I like the addition of potatoes. 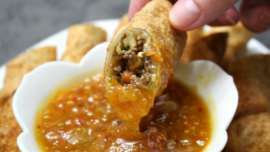 I make a lot of crustless dishes especially at the ctg. since I don’t want to fuss with making pastry and we don’t need the extra calories of pastry. BTW I’m picking your posts up via Bloglovin. When people are sooo health conscious, and there are so many allergies, I find it hard to find something for our craft days. This will fit the bill exactly. Thanks you so much for sharing.